Skype blocking IIS, so O4W failing. Here is one for anyone using O4W and who installs or upgrades Skype. I have been running O4W demos off and on with no issues and just recently I have begun using Skype more and more and it now lunches when Windows launches, rather than only when I want to use it. However, whilst O4W ran fine for a demo last week, it failed to run this afternoon. Well actually, it was not O4W that failed to run as a quick test running http://localhost also failed, proving that the issue was on the IIS side or a port somewhere. After a couple of hours messing around, I threw the towel in and called Jared in the US office. 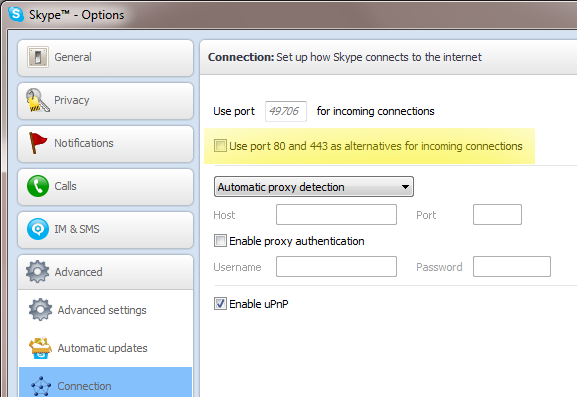 Through his knowledge of such things he quickly ascertained that my O4W port was being blocked by Skype using port 80. Diving into the Skype settings he found that on the Skype Options window I had the ‘Use port 80 and 443 as alternatives for incoming connections’ set. I don;t recall setting that checkbox and I can’t see any reason why I would and I can only suspect that it was set automatically during a recent Skype update. We unchecked the check box and enabled CGI in the computer management module in Windows (I’d turn off and back in IIS which disabled CGI.exe. Restarted the web server and the OEngineserver and all is now well again. So, if your O4W is running fine and then you suddenly start getting 404 errors and you have trouble running localhost, it might be worth checking your Skype settings. The SPP DIRECTORY, ISV CATALOG and CONSULTANTS PAGES have been re-written in O4W and updated. If you would like your OpenInsight-based application listed in the ISV Catalog or your company information listed on our Consultant Listing please contact INFO@REVELATION.COM. Revelation Software is pleased to welcome Barry Hausner as a software developer. OpenInsight 8.x and prior Price Increase. Some of you running OpenInsight version 8.0.8 and earlier have recently been contacting me with regards to the price increase that Revelation have recently announced on their website. From the 1st October 2012 our prices here in the EMEA region will also rise to reflect the RevUS increase. However, with fluctuations in the exchange rate, I will be delaying publication of the revised prices until nearer to the day. If you are a regular EMEA region purchaser (Revelation VAR) and you have quotations in the field or if you will be supplying quotations that will continue to be valid after the 1st October 2012, please contact me for a revised price or to make arrangements for your quotation. In May of this year, Mike Ruane, President of Revelation Software visited with a number of users and customers in Australia and New Zealand. Upon arrival in Sydney on Monday May 14th, Mike met with David Goddard, Managing Director of Revelation Australia. They then met with representatives of TVSN, Australia’s Television Shopping Network. TVSN uses OpenInsight extensively, and the group discussed their needs and future plans. The following day, there was a meeting of Revelation Users and Customers in Darling Harbour, Sydney. After some tea and coffee, waiting for the twenty or so attendees to arrive ( more than had been planned for) David made some introductions, and then Mike began reviewing the state of Revelation Software, plans for the OpenInsight 9.3.2 release, the OpenInsight 10.0 release, and then he began some O4W training. After a delicious lunch, Mike continued with training for OpenInsight’s Banded Report Writer. After a quick drink in the bar, it was off to the airport and Melbourne, where on Thursday Mike and Dave met with another OpenInsight customer all day, had dinner with colleagues from the Revelation world, and met with more customers on Thursday. Thursday evening, Dave flew back to Sydney while Mike and his wife Nancy headed up to Queensland, to meet with ITMS Software in Brisbane. They are a Revelation customer that produces an incredible manufacturing software suite used in hundreds of companies, and is continually expanding. After a weekend spent seeing the sights of Queensland, Mike and Nancy flew to Auckland and were met by Richard Bright, Revelation’s man in New Zealand. After a day of work and preparation, on Wednesday there was a user group meeting for the company’s New Zealand customers and users. Again, there were about twenty attendees, and the program was similar to that followed in Sydney: Introductions of attendees, Revelation plans, O4W training, and BRW training. After the end of the meeting Mike and Nancy climbed into a taxi, and began the long trip back home. Based upon a surge in orders, downloads of upgrades, and evaluation copies of OpenInsight, the trip was a rousing success.